I had to come back down to earth eventually, and this hike was a “normal” hike. That doesn’t mean it lacked views by any means, rather, it was a section of i90 I’ve actually never really looked at before. So despite being a 45 minute drive from Seattle, it was territory I hadn’t seen besides peeking out the window driving down the highway. Let’s see how many peaks I can remember. Fresh snow along i90! We knew it after driving through the Snoqualmie Blizzard (slight exaggeration, but flakes of snow might as well be a blizzard when I haven’t seen it in months) the day before on our way to Navaho Peak. The trailhead for Mt. Washington is right off the highway. This used to be a relief, now I’m a little bummed when I don’t get to take crappy dirt roads. I forgot my discovery pass like a champ, so we parked just before the actual permit area and hiked about .1 mile to the actual trailhead. The trail is steep for about 500ft and then joins up with the John Wayne Trail, a wide open road-like trail. One you’ve reached that, you will pass two small trails heading off into the woods on the left. The second tiny trail is the one you’re looking for. We weren’t positive about even being on the right trail at first, but we figured what the hell, we’ll get to the top of something and figure out what it actually is later. 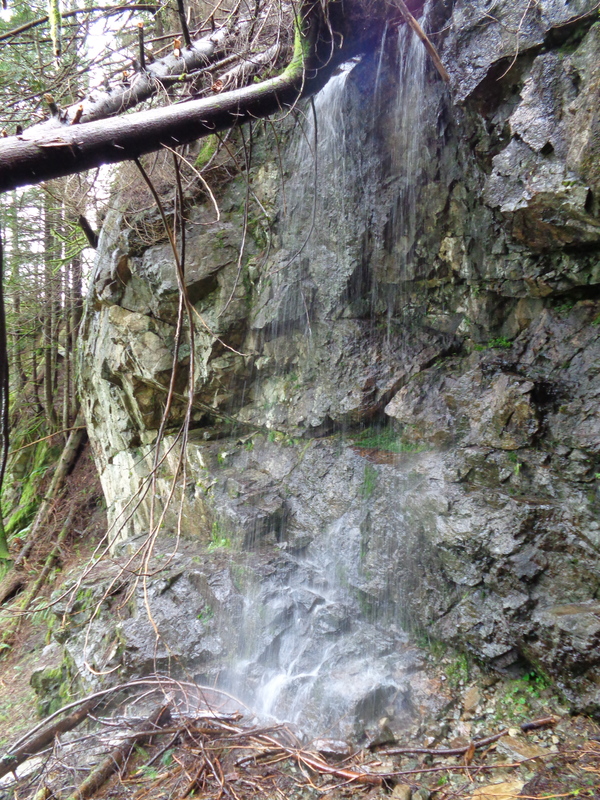 The trail winds through the forest, crossing a few small creeks and waterfalls. Snow started low, maybe around 2000ft. It was slushy. 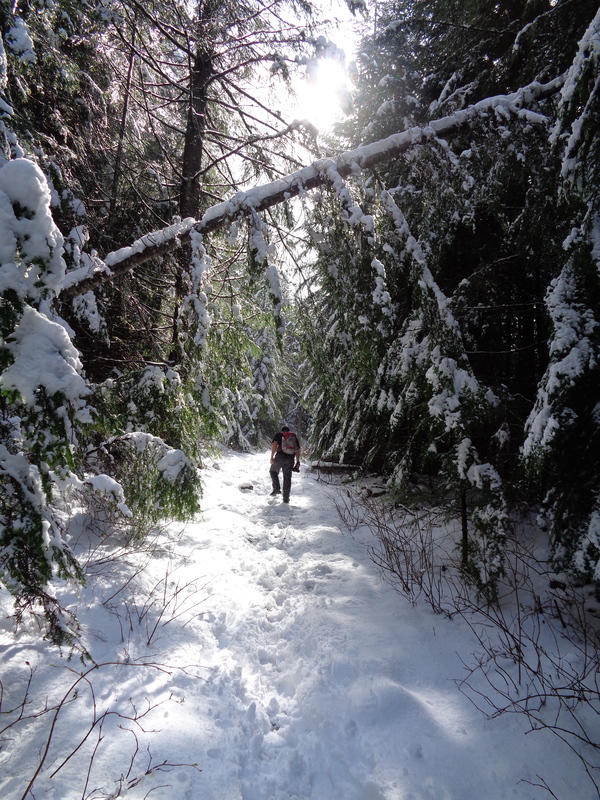 For anyone who hasn’t hiked in slush, it’s like running in sand. Ugh. The trail is easy to follow even when covered for the most part, though there were more than enough boot prints to follow if you’re ever worried. No microspikes necessary, but I did appreciate the grip on my La Sportiva Synthesis that I was raving about a few posts ago. 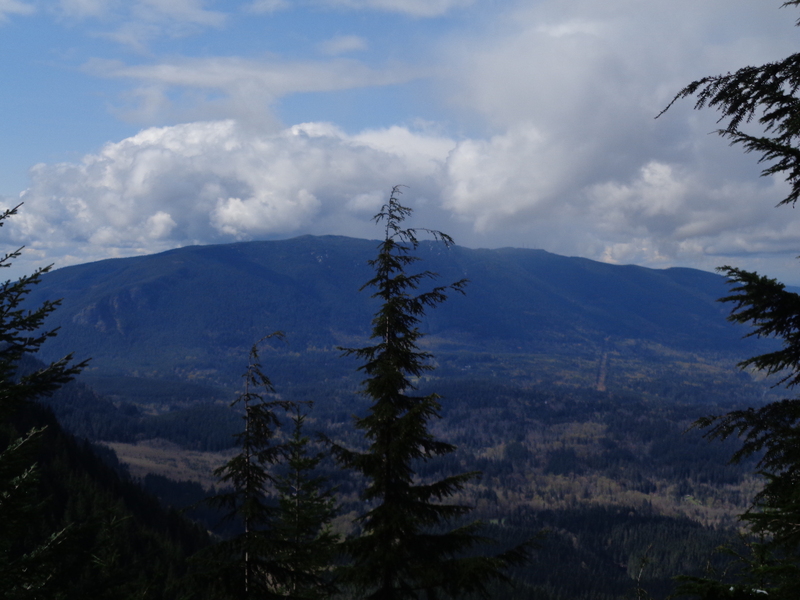 Sneak peeks of views came through the trees – Rattlesnake Ledge, Mailbox, Si. 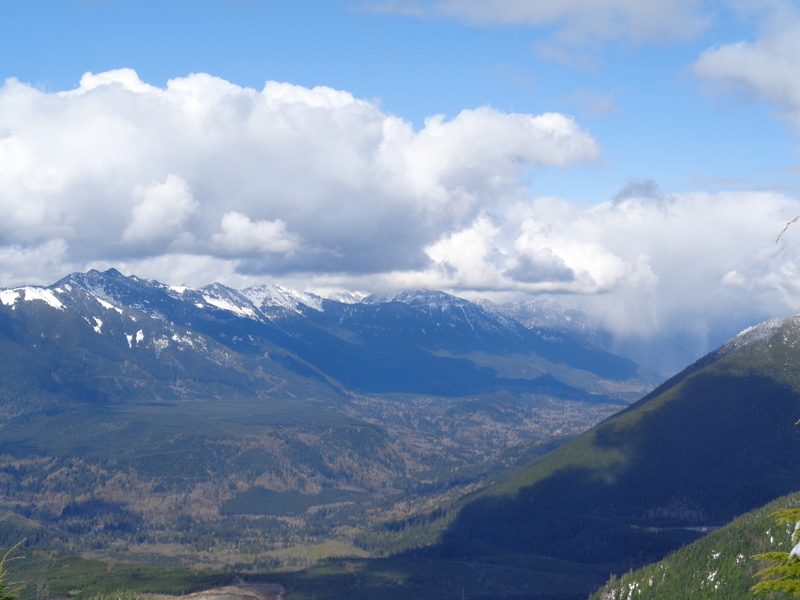 In the pic to the left, you can just barely make out Rattlesnake Ledge – that rocky outcropping on the left. It was cloudy when we started, but the clouds lifted as we went along, and rather than be socked in by clouds at the top, we actually had views in every direction. The party that got there before us said they could only see a few feet in front of them at the top, so we lucked out with timing. 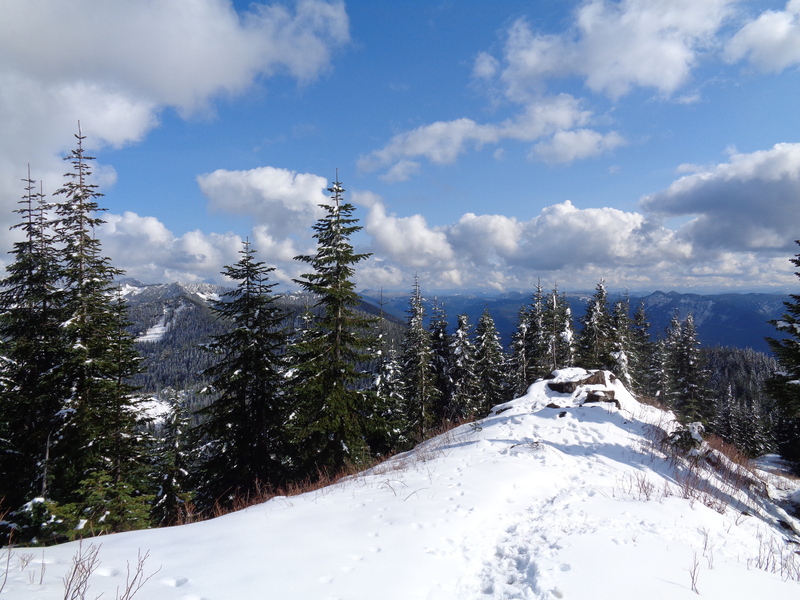 The last ridge up to the summit looks over Chester Morse Lake, which supplies the Puget Sound area with water. From the top, you can see Mailbox Peak, Mt. Si, Mt. Teneriffe, Chance Peak, and I’m sure on a clear day, plenty of others. 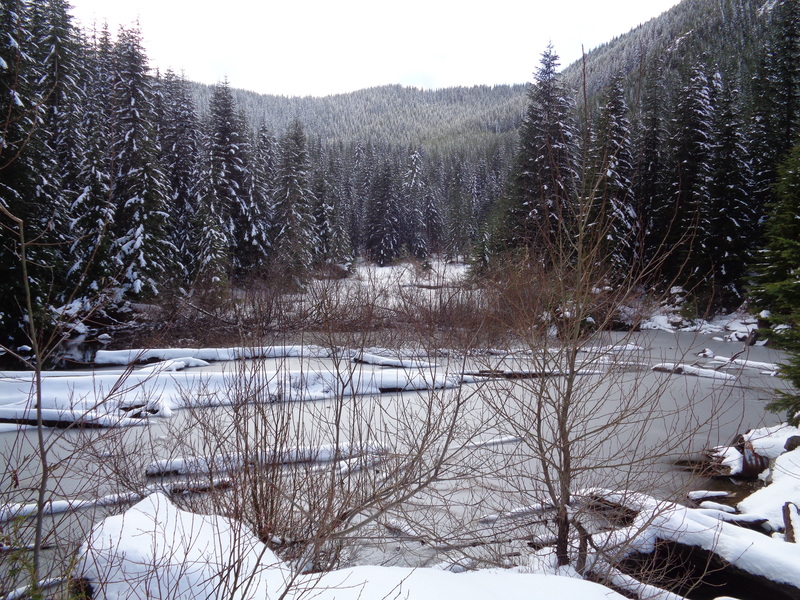 It was the first time I had a visual of what the beginning of hte i90 corridor looked like – I didn’t even realize that the Snoqualmie River fork meant several ridge lines, I had always just assumed there were two: one on either side of i90. Turns out, Mt. 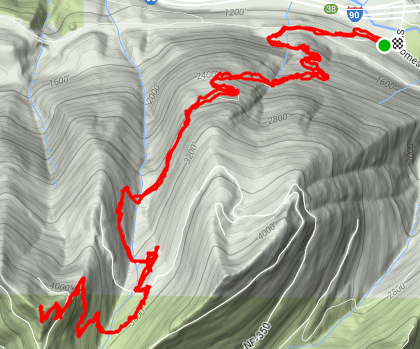 Si and Teneriffe are along a completely separate ridge from Mailbox Peak, the infamously steep hike that seems to be a rite of passage for trail runners out here. Confession: I haven’t done it yet. Once we reached the top, there were two areas to sit. On the actual summit in the sun (and wind) or in a clump of trees in the shade (no wind). I chose sun, but Kyle went to check out the shade. And found a summit register! Hidden in a length of PVC pipe stuck in a tree. 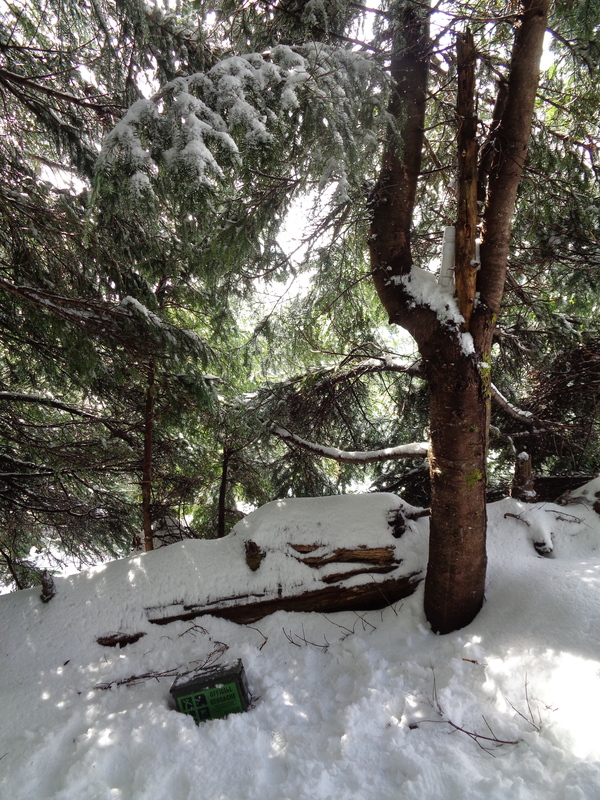 And buried in the snow was an official Geocache… box. I’ve actually never seen on up close before, though I’m pretty sure there’s one beneath the boardwalk at Lake TwentyTwo if you head left when you reach the lake. I saw that one. Nothing too exciting inside this one, except someone’s credit card. I hadn’t brought anything neat to leave, so we just closed it up and put it back. But I have to wonder how many of these I’ve passed on hikes and just never noticed. I bet there are tons up here. Sitting at the summit, I realized how tired I was. It felt like it had taken forever to get there, and now we had to get all the way down. And quickly – I was aiming to be back in time for the Furious 7 premiere. I had work at 8am the next morning, and a pre-movie nap was in order. After downing some easter m&m’s, we packed our stuff back up and were on our way. We did notice a rock climbing area that we completely missed on the way up – perfect for sport climbing. Apparently there are a bunch of places to climb in the area, but since I’ve never tried it, none are on my radar. 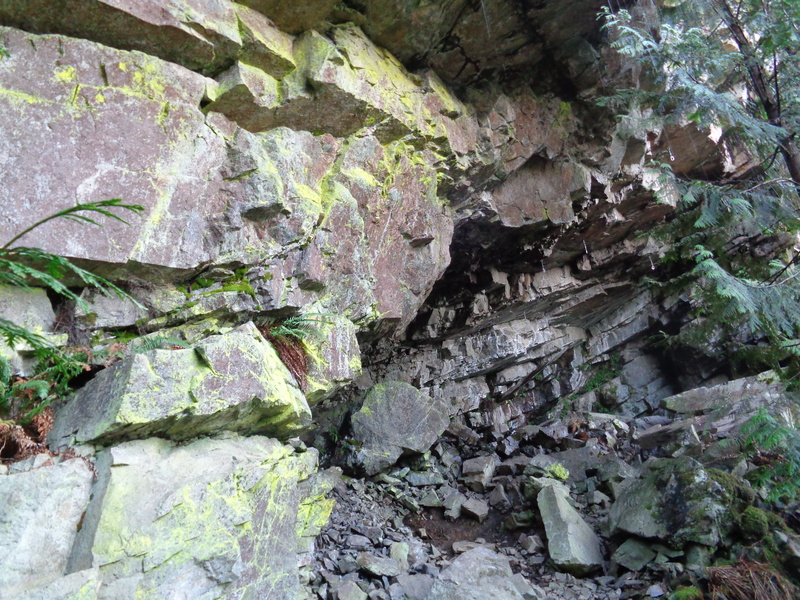 Here’s a pic on the right of the climbing area. I’m assuming the signs for “Great Wall” along the trail are directing hikers to another good rock climb. Good to know for when I decide to give it a shot. Overall, a very straightforward trail that’s a great introduction to the North Bend i90 area if you don’t want to deal with the crowds on Si and Mailbox. 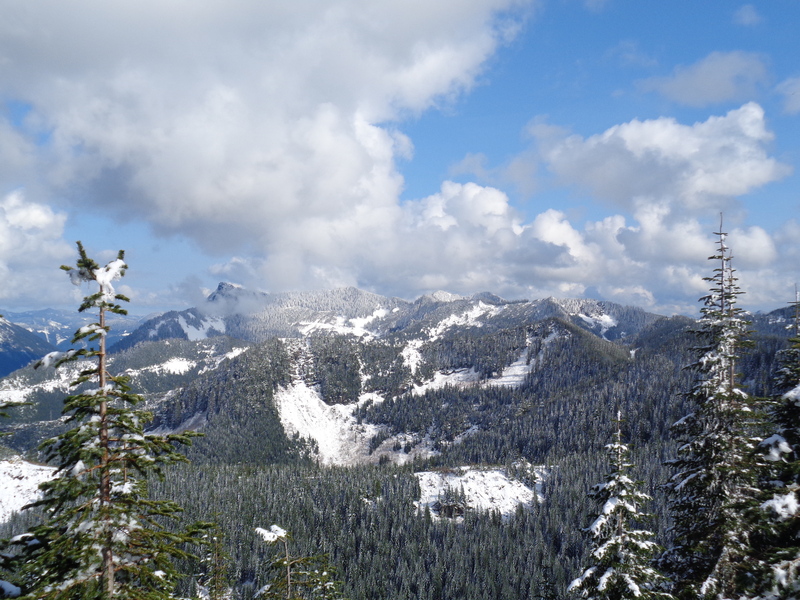 Almost no avalanche danger whatsoever since it’s mostly through trees, but you still get a nice view at the top. Apparently you can even see Rainier on a clear day. Strava map here. Also, a few hikers lost their car keys on the trail! We saw a sign written in snow that said “KEYS!” in bright red (no idea how they did that, it wasn’t just red juice) followed by “PARKING LOT” (I think). Safe to say someone dropped their keys and another hiker found them, and according to the trip report on WTA later that night, that’s exactly what happened. Hikers out here are great. By now, I’ve had car keys returned, snowshoes taken (kindly – they thought they were doing us a favor), food shared, directions shared, a dog leash returned, teamed up with random hikers to get farther than I would solo, someone even left a note on my buddy Jonathan’s car when she thought we might have left his GoPro on a rock at Heather Lake. We were just taking a timelapse, but still. Someone give me a chance to pass it forward, dammit!